Hoop Nut #UAAP79 De La Salle FEU NU UAAP UE #UAAP79 Roundup: Bulldogs repulse UE and Archers survive FEU on Day 2! Day 2 of #UAAP79 was full of action as NU leaned on their size against UE, while DLSU’s deadly duo of Ben Mbala and Jeron Teng came to fore in their win over bitter rival FEU. 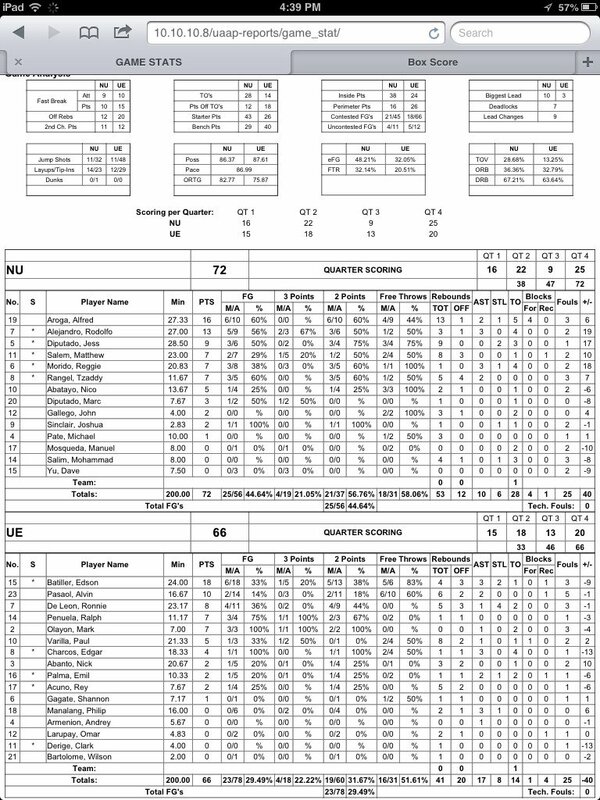 The NU Bulldogs leaned on some steady play in the end-game to outlast the UE Red Warriors, 72-66, in UAAP Season 79 action Wednesday at Mall of Asia Arena. Alfred Aroga, who finished the game with a sprained ankle, posted a statline of 16 points, 13 rebounds and four blocks to pace the Bulldogs, who were the UAAP champions two years ago. J-Jay Alejandro also chipped in 13 points, three rebounds and three assists. Both teams engaged in a tight battle after the Bulldogs’ 10-point lead in the first half was erased by UE. BonBon Batiller paced the Red Warriors with 18 points. Alfred Aroga (NU) - 16pts, 13rebs, 2asts, 1stl, 4blks, 6/10 FGs. BonBon Batiller (UE) - 18pts, 4rebs, 3asts, 2stls, 1 triple. The De La Salle Green Archers, considered by many as the favorites in UAAP Season 79, lived up to their billing in their opening game as they downed last season’s champions FEU, 83-78, in a tough encounter on Wednesday at the Mall of Asia Arena. Jeron Teng led La Salle with 28 points on 11-for-21 shooting from the field. He also grabbed six rebounds and made several key baskets down the stretch. 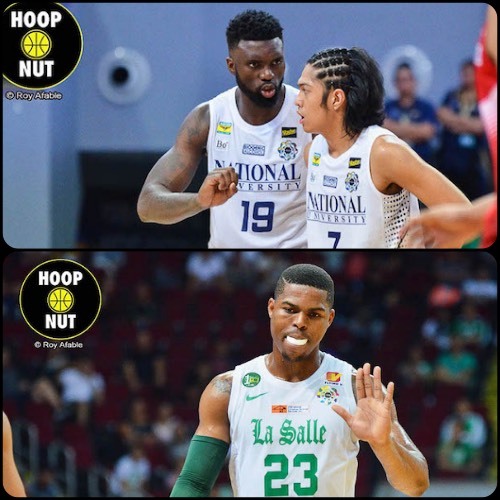 La Salle’s Cameroonian recruit Ben Mbala also had a huge game, tallying a double-double with 13 points and 23 big rebounds in his much-awaited UAAP debut. Also making an impact for the Green Archers were rookie Aljun Melecio, who scored 10 points and hit two three-pointers, and Abu Tratter, who had seven points and eight boards. La Salle (1-0) led by as many as 16 points in the second half but needed to hold off a huge FEU rally in the endgame. The Tamaraws will open their titled defense bid at 0-1. 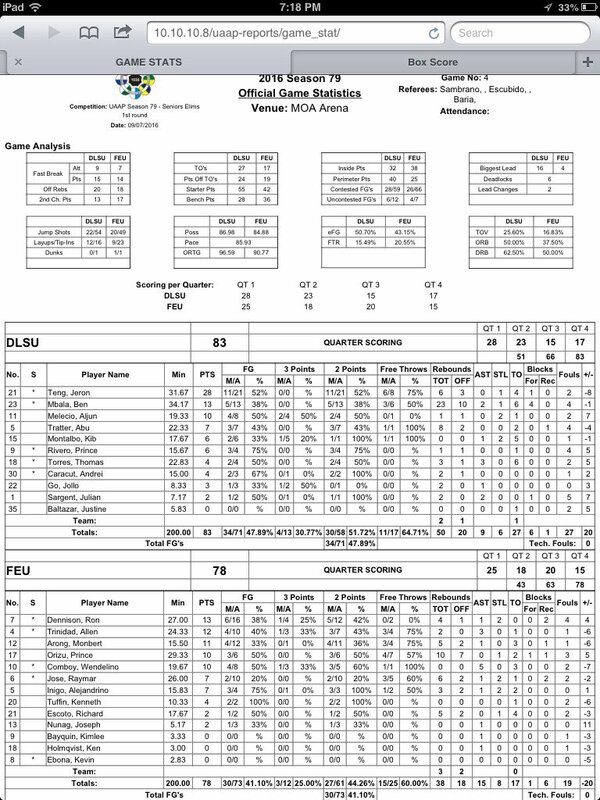 Ron Dennison and Allen Trinidad led FEU with 13 and 12 markers respectively. Ben Mbala (DLSU) - 13pts, 23rebs, 2asts, 1stl, 4blks. Prince Orizu (FEU) - 10pts, 10rebs, 1stl, 1blk, 50.0 FG%.